Can you confirm these amateur observations of Gallotia caesaris? Types Syntypes: private collection of P. LEHRS, Spain, Canary Islands, Hierro. Comment A footnote in the description refers to a “preliminary description” in no. 134 (p. 41) of the PZS, which we couldn’t locate, hence we consider the formally published paper on p. 681 as original description. Bischoff, W. 1998. Gallotia caesaris (LEHRS, 1914).In: Handbuch der Reptilien und Amphibien Europas. - Bd. 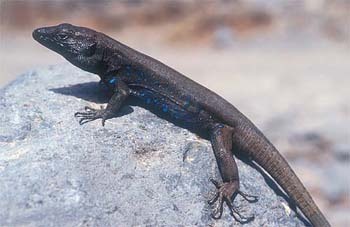 6: Die Reptilien der Kanarischen Inseln, der Selvagens-Inseln und des Madeira Archipels. Aula Verlag, Wiesbaden, 448 pp.